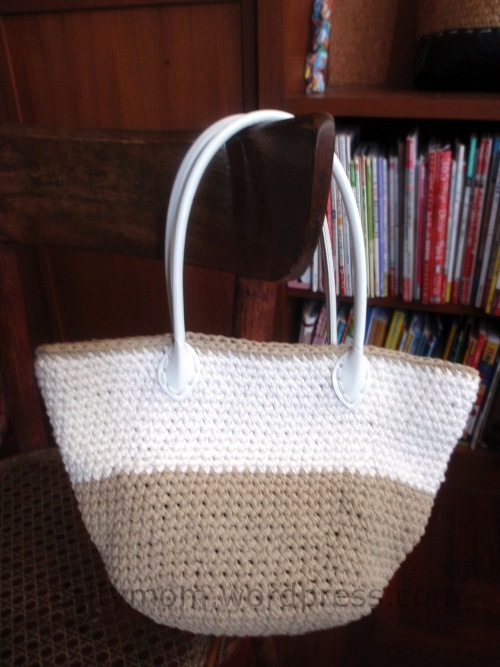 At last, the fruit of Saturday piano classes… a crocheted tote bag ! Like, Huh ? what is she talking about ?? You see, I wait for my kid’s class to end at the music school, so I usually bring along something to play with. For this bag, I winged the pattern. Just crochet an oval base to the width of your liking, then alternate one round of increase with two rounds of no increase till you get the height you want . Does that make sense ? They came with tiny tiny holes which won’t fit my blunt end needle, nor the cord I planned to use. So I knocked in new holes. I placed a piece of felt underneath when I pounded the holes. This piece will be the reinforcement piece on the inside of the bag. Thread both ends of the cord into the needle hole so that when you make the first stitch, you can just go thru the loop on the other end. This way you don’t have to tie a knot on the ends. On the “downstroke”, make the needle go between the cords. This will form a neat and tidy stitch. 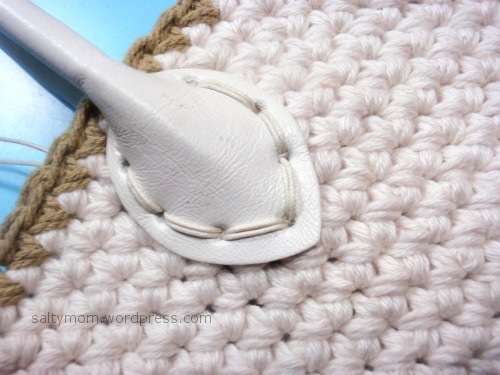 Go around the handle with this stitch. Sorry didn’t take photo of the back side, but when you reach the beginning point, you knot it off at the back just like regular sewing. Then , slide the needle under the stitches until you are satisfied that it is so chaotically tangled that it won’t know which way to fall off. This is how the finished handle looks like. The cord covers up the tiny “pre-poked” holes. I like it when I write my own diys, I get to make up new words along the way. This is the finished bag. Below is the inside of the bag. 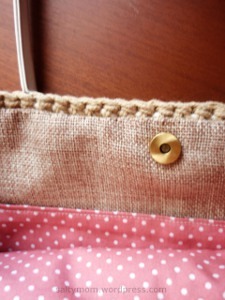 I use polka dots fabric for the pockets. Very cool! I love this! 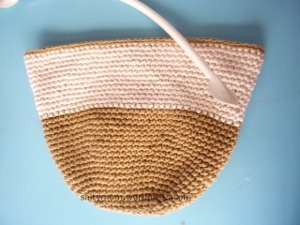 I need to make linings for my crocheted bags, but now I’m going to need to get handles like those too!